CDN Solutions Group is a significant IT outsourcing company, established in the year 2000 with a vivid vision to become a one-stop-shop for IT services ranging from mobility, enterprise applications, data modeling to business logic, UI/UE, eCommerce, AR, and IoT. Chetan Naik and Surajit Mitra, co-founders of CDN Solutions Group have nurtured the company from a start-up to a 100% export-oriented offshore software development center. 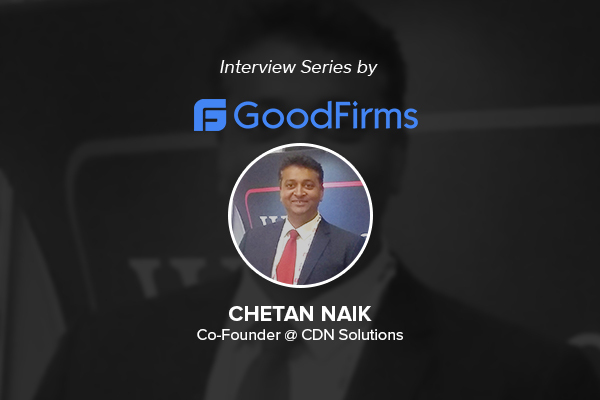 In the scoop interview with GoodFirms, Chetan talks about the skills and proven experiences used by the firm to diagnose the problems, and deliver high-quality cost-efficient software solutions. The company portrays a value-added perspective for its clients by delivering foretell solutions adhering to various web designs and IT requirements. He also added that the company takes strong measures to enhance the client retention ratio which ultimately sums up to 80% of the company’s total business. The firm undergoes an internal test to ensure excellent user experience before delivering any web design and software development solutions to its clients. The top executives help clients with strategic advice and practical support to make every project successful. CDN Solutions serves to a large spectrum of industries like branding, gaming, banking & insurance and real estate. This prudential approach of the company has led to the gushing reviews from its clients and an enviable recognition on the list of Top Web Design Companies in North Carolina and Top Python Developers at GoodFirms. Chetan vigorously suggests that a client who is looking for mobile app designs must use native platform for delivering high-end user experience apps and cross platforms for simple apps depending upon the demographics and target audience. The backend of a mobile app generally requires 60% of the total time when compared to front-end designing at CDN. The group is ecstatic in offering IT services to scads of clients and projects that encompasses robust ideas and zeal of the clients to make it live. Read the full interview to get swayed about the mobile app building strategies articulated by the co-founder of CDN Solutions himself. Get acknowledged with the significant views of Chetan on the business models used for generating revenues at the agency with mobile applications. Also, get personal insights of Chetan on the factors considered to evaluate the cost of developing the mobile apps at CDN. Check CDN Solutions Group profile on Good Firms.